Israeli forces killed Monday more than 60 Palestinians near Gaza border with Israel as protests against the transfer of US embassy from Tel Aviv to Jerusalem erupted. Sixty-two Palestinians were killed on Monday in the deadliest day in the besieged territory since 2014 war, reported the Kuwaiti news agency Kuna. 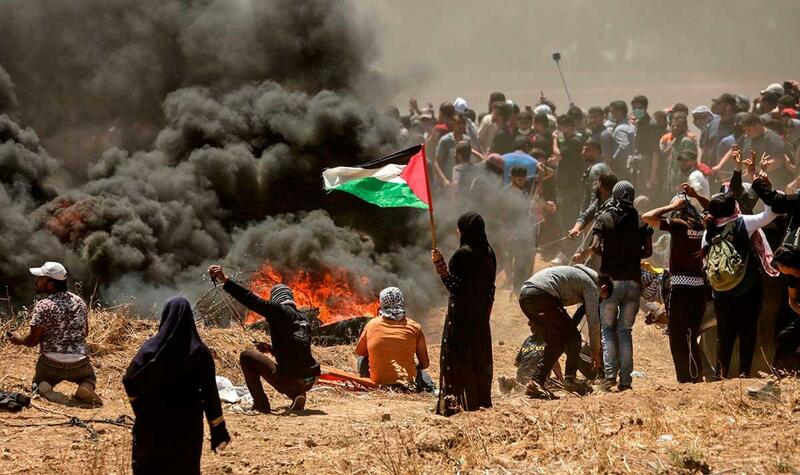 It was the highest Palestinian death toll in a single day since Hamas-led demonstrations began along the border fence on March 30; and the highest number of casualties inflicted since the 2014 conflict with Israel inside Gaza. Monday victims include eight children under the age of 16 according to Palestinian officials. Over 2,400 Palestinians were wounded as Israeli snipers continued to fire into the crowds in an attempt to suppress the demonstrations. The death toll since March 30, the beginning of the protests commemorating the Nakaba, has reached 109 protesters among whom journalists. There has been no victim on the Israeli side. The Monday demonstration, which gathered 40,000 Gazans according to Israeli account, was held in protest against the official transfer of the US embassy from Tel Aviv to Jerusalem. The ceremony was attended by 800 guests. President Donald Trump’s daughter Ivanka and her husband Jared Kushner were among the US officials attending. Last December, President Trump declared the old city capital of Israel, scorning therefore international consensus over the fate of the disputed city to be discussed at the final status negotiations. Palestinians hope to declare the eastern part of the city the capital of their future state. The mass killing and controversial embassy relocation drew condemnation from around the world, including from Kuwait, Morocco, Saudi Arabia, Turkey, France, Belgium, UK, Germany to mention but a few. Several European countries have summoned the Israeli ambassador to protest the deadly violence. South Africa announced it was calling back its envoy to Israel with immediate effect in protest against the indiscriminate and gravity of the latest Israeli attack. The African country also called for an independent inquiry into the Israeli killings. In New York, UN Deputy Spokesperson Farhan Haq said in a statement that “the Secretary-General is profoundly alarmed by the sharp escalation of violence in the Occupied Palestinian Territory and the high number of Palestinians killed and injured in the Gaza protests”. Meanwhile, Kuwait called for an emergency meeting of the Security Council, due to convene this Tuesday, and said it will circulate a draft UN proposal calling for the protection of the Palestinian civilians. UN Ambassador Mansour al-Otaibi said on Tuesday, the draft would be circulated “most probably tomorrow” and would be designed to protect the Palestinians and “provide international protection for civilians”. Written by: KanelkaTagba on May 15, 2018. Posted by KanelkaTagba on May 15 2018. Filed under Headlines, World News. You can follow any responses to this entry through the RSS 2.0. Both comments and pings are currently closed.